Our thoughts and images of what an ideal parent or lover or leader should be can get in the way of just being the best we can be in any given moment. Maybe you love your spouse but he never remembers to take out the trash. Or your daughter is happier as an artist than a dentist. Or you were going be that boss who always stays calm but instead often loses your cool. Here’s a reflection that may help you align your view of what is with what’s really there. One note of caution about family: If it’s too intense to contemplate your family life, skip this exercise. Mindfulness can be used around trauma but ideally when integrated into some kind of therapy. 1. For the next week, notice when something isn’t fitting into your view of what your life “should” look like. Try writing it down. 2. After a week, look at your list. Notice first those things actually under your influence, such as logistics or a miscommunication that requires resolution. Of course, don’t judge yourself if you haven’t actually quite figured out how you’re going to manage, but recognize that you could when the time comes. I’m going to try to schedule more family meals. I’m going to get the team together for informal eye-level chats. For things that are not actually under your influence, how realistic is your picture of the situation right now? When you find your experience overly weighted by feeling you or someone or something “should” be better or different, pause. Focus your attention instead on a few breaths, or an activity with your loved ones, or another brief mindfulness practice. Instead of treading down that rutted road again, take a moment to actively seek out whatever there is to enjoy as an imperfect person, living in an imperfect family, during any particularly imperfect day. Take a moment to actively seek out whatever there is to enjoy as an imperfect person, living in an imperfect family, during any particularly imperfect day. 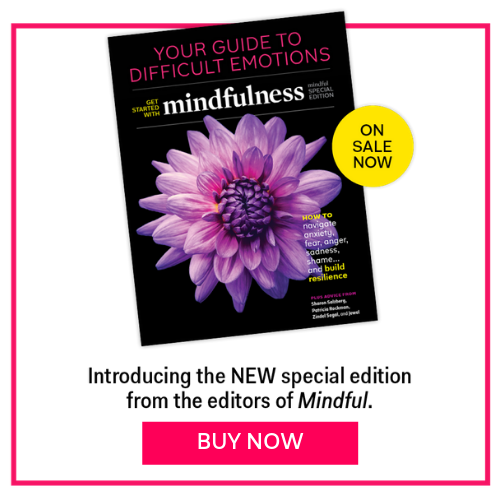 This practice is part of a feature article titled, “Living with, and Loving, Your Imperfect Life,” which appeared in the June 2016 issue of Mindful magazine.